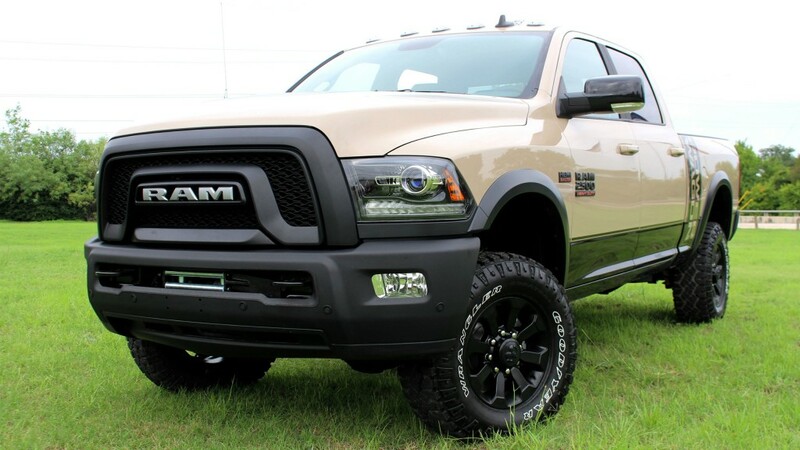 Ram's Power Wagon is now available with the Mojave Sand package. Ram Truck has announced a new limited-edition colour for its off-road king - the new 2018 Ram Power Wagon Mojave Sand package. "The Ram Power Wagon is the most off-road capable production pickup in the market today and offering the new Mojave Sand special-edition will appeal to enthusiasts looking for a truck that stands above the crowd," said Jim Morrison, Head of Ram Brand - FCA North America. "Power Wagon is extraordinarily competent off-road and provides both the towing and payload required in a heavy-duty truck." This is the first time Mojave Sand exterior paint has been available on a Ram Heavy Duty truck and is exclusive to the Power Wagon. To accompany the new colour, new all-black wheels create a complete exterior design element. The limited-edition features an all-black interior with Ram's Uconnect 8.4-inch touchscreen. Also part of the package, the Power Wagon Mojave Sand adds the Heavy Duty Luxury Group, which includes LED bed lighting, overhead console, power heated/fold-away mirrors and a universal garage door opener. The Ram Power Wagon Mojave Sand limited edition is available in Crew Cab 4x4 at a starting Canadian MSRP of $61,865 plus $1,895 destination and will arrive in dealerships in the fourth quarter of 2018. Based on the Ram 2500 Heavy Duty 4x4 Crew Cab, the Power Wagon is packed with purpose-built off-road features, including a unique suspension with more than 51 mm (two inches) of lift, 363 mm (14.3 inches) of ground clearance, front and rear locking differentials, an electric disconnecting front sway bar, 33-inch Goodyear Wrangler DuraTrac tires and a 5,443 kg (12,000-lb.) winch. Powered by a 410 horsepower, 6.4-litre HEMI V-8 engine, the Ram Power Wagon is the most off-road capable production pickup available. Dating back to 1945, the Ram Power Wagon's heritage holds a distinctive position in the Ram Truck lineup as an example of engineering innovation and off-road capability with best-in-class, can-do toughness. The Power Wagon nameplate was initially produced through 1980. Early trucks were based on the Weapons Carrier (WC) series of Dodge 3/4-ton military-use trucks built during World War II. The Power Wagon went on to become a well-known civilian vehicle. The iconic truck was reintroduced in 2005 and now exists as an independent model in the Ram Truck lineup.